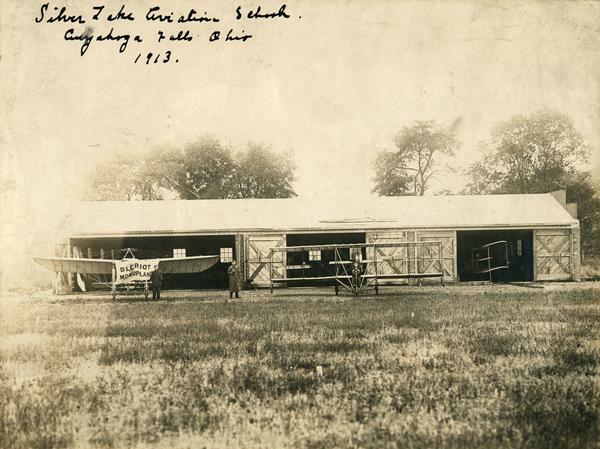 Hangar of the Ohio aviation school of Dr. Rudolph Silverston, formerly of Milwaukee, together with three planes: two Curtiss pushers and a Bleriot monoplane. Flying instructor John Kaminski is thought to be the man in the duster. During the winter of 1912-1913, Dr A. Rudolph Silverston, part aviation visionary, part shyster, abandoned his Milwaukee investors and relocated to Ohio. Rudolph persuaded Kaminski to come along as a flight instructor. Seen here are two Curtiss pusher type airplanes and, on the left, a Bleriot, a French design. Compared with the pushers, the forward looking Bleriot monophane illustrates how quickly the French had taken back the leadership in aviation. Milwaukeeans saw this plane as well, for it is known that Silverston had the Bleriot even before he left Milwaukee.